Genzyme announced that the FDA has approved Aubagio (teriflunomide tablets), a new once-daily, oral treatment indicated for patients with relapsing forms of multiple sclerosis (MS). Aubagio has shown significant efficacy in reducing relapses, slowing the progression of physical disability, and reducing the number of brain lesions as detected by MRI. The approval was based on efficacy data from the Phase 3 TEMSO (TEriflunomide Multiple Sclerosis Oral) trial evaluating more than 5,000 patients in 36 countries. Aubagio 14mg significantly reduced the annualized relapse rate (P=0.0005) and the time to disability progression (P=0.0279) at two years vs. placebo in patients with relapsing forms of MS. Additionally, Aubagio 7mg significantly reduced the annualized relapse rate (P=0.0002) in the trial. 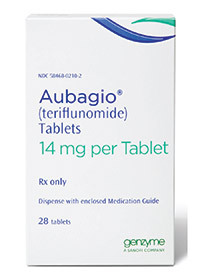 Aubagio is an immunomodulator with anti-inflammatory properties. Although the exact mechanism of action for Aubagio is not fully understood, it may involve a reduction in the number of activated lymphocytes in the central nervous system. Aubagio will be supplied as 7mg and 14mg tablets. Genzyme expects to make Aubagio available on October 1st, 2012. For more information call (617) 252-7500 or visit www.genzyme.com.